I'm back from two weeks out west, where I reveled in freedom from my laptop and read blissfully. I thoroughly enjoyed Anne Tyler's delicate exploration of life between cultures in Digging To America, but would love to hear from Iranian-Americans about how the author depicts their community. Two YA reads that I devoured were E. Lockhart's The Boyfriend List and Sarah Dessen's This Lullaby. While some of the racier bits made the parent in me squirm, both authors treat their teen protagonists with immense respect and employ a fresh humor that was inspirational. Finally, I read Scott Westerfeld's Uglies and Pretties ... interesting page-turners, but I found myself wondering how a teen with "squinty eyes" (Asian? This is how Westerfeld describes his protagonist when she is an "ugly") and/or "frizzy hair" (African-American?) 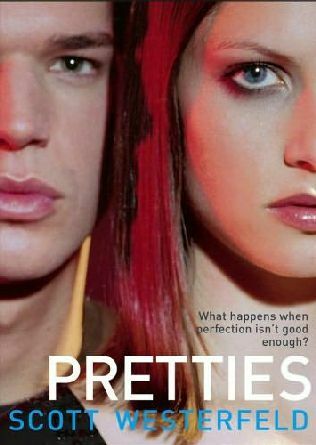 would respond to the author's descriptions of the mesmerizing "pretties," with their big, wide eyes and straight hair. In his futuristic world, there's a "certain kind of beauty, a prettiness that everyone could see. Big eyes and full lips like a kid's; smooth, clear skin; symmetrical features; and a thousand other little clues." What do others think about this? On the writing front, I came back to the delightful news that Charlesbridge made an offer on The Bamboo People, my novel about a teen soldier and a refugee boy who meet along the Thai-Burma border. Now I have to write like crazy, as the first draft of First Daughter Book No. 2 is due to Dutton by Sept. 1. I'm off to Peet's Coffee for three empty latte cups or 5000 words, whichever comes first.